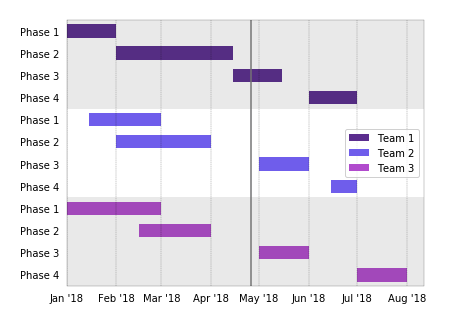 Gantt charts are a great way to show which projects and tasks different teams are working on at a given time. 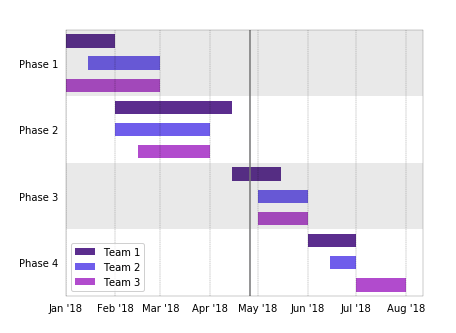 This chart type is heavily used by Project Managers, Task Managers, and anyone else managing multiple workflows. groupby: either 'team' to group the y axis by the team, or 'project' to group by y axis by project. This value defaults to 'project' if not explicitly defined. The above chart uses the default 'project' groupby. Updating this to 'team' generates the chart below. Below is the Python snippet used to create the function for the Gantt chart above. Any other functional chart types you would like to see in R/Python?